Robbery, employee theft, shoplifting, shrinkage -- all these are problems for retail stores. Retail stores tend to be easy targets to attract these types of crimes. A well-planned and implemented video surveillance system from Unified Technology Solutions will help you protect your customers, merchandise, associates, and most importantly -- profits -- from theft and vandalism. Prevent Theft Strategically placed cameras will help your store control shoplifting, vandalism, employee theft and shrinkage from storage areas. Customer Perception The presence of video security cameras demonstrates your commitment to customer safety. 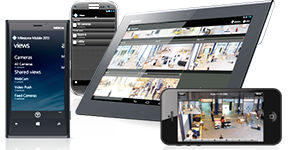 Remote Access All C&CC Video Surveillance Solution include our easy-to-use Client software. Running from a server installed in your store, live video feeds are remotely accessible through a secure internet connection. Advanced Video Analytics . Whether the challenge is shrinkage, fraud, clerical errors, shoplifting or simply providing customers with a safe shopping environment.